An indicative design of the new members' area at the Royal Highland Show. Plans for the new members’ area at the Royal Highland Show have been revealed by the Royal Highland and Agricultural Society of Scotland (RHASS). 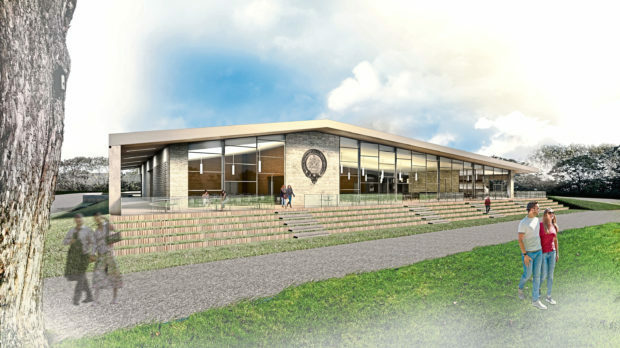 A planning application for the new facility, which is designed to replace the previous MacRobert Pavilion at the show’s site at Ingliston, near Edinburgh, has been submitted to Edinburgh City Council for approval. RHASS chief executive, Alan Laidlaw, told a press briefing that he hoped the new multi-million pound facility would be built and ready for use at the 2020 Royal Highland Show. He said a temporary facility would be erected again for members attending this year’s show, which takes place on June 21-24. RHASS head of operations, Mark Currie, said the new building would be single-story with astroturf surrounding it along with tiered steps, which would double up as extra seating. He added: “It will sit on the same footprint as the old building and we have slightly altered the angle to have a better view of the main ring. “It will have high-spec pre-cast concrete and some traditional bricks on the exterior, and entrances from all sites. RHASS commercial director, Lorne Scott, said the new building had been designed in a way that it could be used for other purposes when it was not needed for the Highland Show. He said there was expansion room outside to erect a marquee for extra space, and the facility would house a bar with capacity for 100 people. Mr Laidlaw said the ability to use RHASS assets, such as the members area, for other uses throughout the year was key to raising funds for the society’s charitable aims. He said: “This is the next generational investment that we are making here in the society, the membership, the show and the business. He said the new Moxy Hotel, which is being built on society land near the airport, would generate RHASS income for years to come as the land has been made available on a long-term lease, rather than being sold off to the hotel.